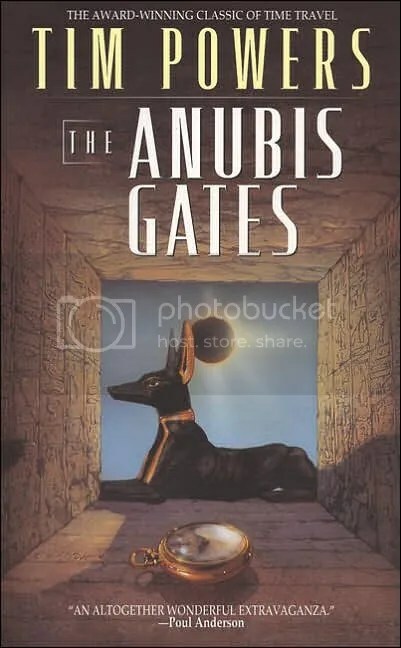 So, I bought Tim Powers’ novel, The Gates of Anubis, just for the fun of it. Well, as you might know, it’s a pretty good science-fiction novel – good, as in, “it’s literature”, not good as in, “it’s mildly entertaining if you hit me over the head before I start reading” – and, oh the surprise, it features a journey through time, to one of Mr Coleridge’s lectures on Shakespeare! I like the book, because it’s intelligently written – the author tries to play a bit with the topics he describes, rather than just narrating them. Now, this is certainly a text just as serious as a time-travel story can get – but it is written for an educated audience, and entertainingly so. I am usually not very generous with my compliments to writers in general, but I think I will read more books by this Mr Powers, who previously was pretty much unknown to me, other than one of his other books apparently served as a ghostscript for the last, and pretty dull, installment of Disney’s Pirates of the Caribbean series. Happy Halloween, with “Dear Esther”. Well, if you cannot see the connection between the poetry of Mr C, and the hauntingly beautiful, and eventually disturbing Dear Esther, well, then I am very sorry. Dear Esther in many ways embodies what I like about my favorite texts from Coleridge: Where other writers put shockers and grotesque imagery, here, there’s quiet gloom. Nothing more to it, really. Enjoy the virtual ghostwalk! Some beautiful screenshots, as well as the entire game soundtrack are available at the official page as well, and, most importantly, for FREE. So, in my last post, I spoke about the metal band Nightwish, and their references to Coleridge’s “Rime” in their 2004 album, Dark Passion Play. Now, one might ask, with two songs on the same album referencing the same poem, is there a bigger concept behind those mentions? I’d say, not so much. One thing that has always kind of bummed me out about Nightwish’s studio albums was the lack of a concept or plot, something that most lesser known metal bands usually manage to work into their music, like, say Dream Theater, Avantasia, or Blind Guardian. – That’s not judgement about the music itself; of course. But don’t expect Dark Passion Play to be a musical setting of poetry, or, for that matter, the lyrics of the songs to be deep, post-modern reflections about topics first touched by the Romantics. Nightwish, like most bands of its kind, enjoys making mostly unpretentious folk metal with a distinctively escapist tone, no more, no less. To enjoy it best, is take it for what it is, at face value. The band Nightwish, one of the more famous symphonic metal acts in the world, is certainly going to be heard around many Halloween parties this year, as the whole Western world will be caught up in the Gothic season. Nightwish is sort of famous (or, from my point of view, rather notorious, because I don’t particularly like how they do it) for treating with “Victorian”, or, in a broader sense Gothic literary themes in their songs. So, it comes as little enough of a surprise that the band has also referenced the Rime in their songs – and not just once, but twice. On the 2004 album Dark Passion Play, two songs containsome pretty obvious references to The Rime of the Ancient Mariner. While I personally have to confess that the rather unsophisticated approach that the heavy metal scene in general takes on classic literature, I can’t object on the songs themselves. Nightwish has surely managed to become an all-time classic in their genre, and their songs are hauntingly beautiful. Nightwish, “Sahara”. From “Dark Passion Play”, 2004. Track 7. Nightwish, “The Islander”. From “Dark Passion Play”, 2004. Track 10. “Die Vermessung der Welt”, English title “Measuring the World” hits German cinemas on October 25! What was the sea to Coleridge, for example? – Well, first off, it was uncharted and the big Unknown. Or so will many teachers tell you, in an instant reflex. But what did that REALLY mean for Coleridge and his contemporaries? In a world where maritime terror has been redefined by movies like Open Water, or that classic Jaws, it seems extraordinarily difficult to develop an idea for how naval travel and, the world in general, without satellites, radar, Google Maps, and a modern scientific understanding. Long story short, I think the book, and now the movie, make for a good, if goofy introduction to the overall topic of 19th century cultural anthropology, by retelling a, from what I understand, largely ficticious account of the lifes and times of the three 19th century luminaries Alexander von Humboldt, Carl Friedrich Gauss, and Aimé Bonpland, and, as the title of the novel suggests, their efforts to measure the size of the world. Now, don’t be mistaken – the aim of this product is to entertain, not to teach. But as entertainment, it delivers. I am watching this, and smile, but for all the wrong reasons. By the way, while the movie is oh so much cheese, the book is quite awesome! I think in the wiki-article on Blixen it says it is generally regarded a mistake that she wasn’t given the Nobel Prize for her work. I concur. I think it’s a mistake that her book (and the cheese-throbbing movie) is today generally regarded “women’s literature”. It is not; my prediction: If you like F. Scott Fitzgerald, you will like this author, too. Stumbled over it on Deviant Art, by the very talented ilustrator, C. Billadeau. Sort of reminiscent of the 60s and 70s pop art, but still not all too cheesy. Like, it’s Romantic poetry. One has to embrace a little bit of cheese, at the very least. Anybody who protests that has to read Mr. C’s Fire, Famine, and Slaughter. To a group of people. Aloud.